*If you’re lactose-intolerant Lactaid’s Eggnog mix is just as delicious. The term, “loose egg custard beverage” is probably a little off-putting, but did I mention that it’s usually spiked with your favorite spirit? Pumpkin spice may reign in the fall, but December was made for the better ‘nonbasic’ drink we know as Eggnog, and it’s time for this holiday beverage to shine. Eggnog is a dairy-based beverage consisting of heavy whipping cream, egg yolks, vanilla, cinnamon sticks for spice and a cute garnish! In the spirit of holiday cheer, in our recipe above we added shaved nutmeg to top it off. We are very busy young professionals so if you haven’t noticed, our theme for our Drinks of the Week this month have all been easy, festive, and made for holiday entertaining. We haven’t found a quicker, better eggnog than this partially homemade recipe. We like the Southern Comfort eggnog but if you are dairy free, we have found that Lactaid’s Eggnog is very enjoyable and doesn’t skimp on the flavors! Now, okay, we bought the eggnog, but we aren’t just serving it straight! We prefer to enjoy this beverage in a traditional colonial way, AKA loaded with booze. Although you can use any spirit really, we found equal amounts of brandy and aged rum with a lesser quantity of eggnog, balances the milky beverage and the dash of nutmeg really highlights the spices of the liquors. The end result will yield a beverage with an ABV of 30%. Back in the day, this beverage was to be served in a nog, or in other words, a wooden cup from the 1500s. With the beverage being made of eggs and being served a nog the two words came together and thus, we know this beverage as Eggnog. Nowadays, Eggnog is served in footed glass goblet and traditionally garnished with a cinnamon stick. Truly, it’s the best way to enjoy it especially if you’re needing a little extra help getting through holidays with your in-laws! Eggnog has made its way successfully around the world having different variations representing different countries. Mainly, countries in Latin America that have taken on their own adaptations of this holiday drink. In Puerto Rico, they use coconut juice or milk. There, the eggs are typically left out and the drink is called coquito. In Mexico, they have a Mexican Chocolate variation of American Hot Chocolate but instead of chocolate, they use eggs. Their eggnog adds in Mexican cinnamon and vanilla with either rum or grain alcohol creating rompope. 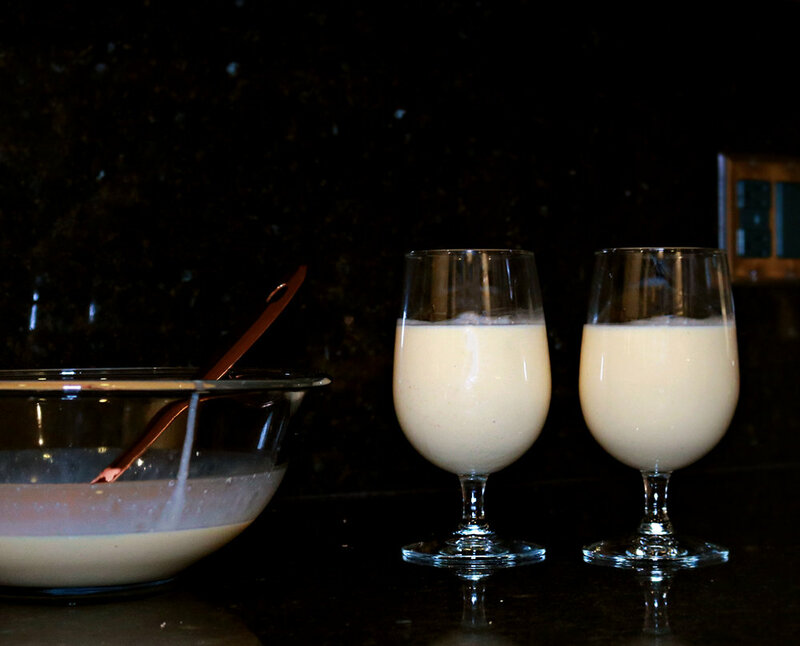 In Peru, they make their eggnog with pisco, which is their style of brandy. Much like other holiday favorites it’s origins are constantly debated, so, we’ll dive into those details later! What we do know is that Eggnog has been around for a few centuries. Our research shows the origins come somewhere out of medieval Britain, but they didn’t make the eggnog we know today. They made what they called “posset.” Posset was a milk beverage made with wine or beer, cream, sugar, egg, and thickened with anything that had yeast or starch including a large spectrum between breads and oatmeal. The recipe didn’t call for the eggs until the 13th century when the monks took to liking their posset being thickened with eggs and sweetened with figs. Back then sherry, eggs, and wine were luxuries only the wealthy could afford to enjoy! Therefore it was used to toast to prosperity and good health. When you think about it, that’s rather ironic considering how unhealthy this beverage is. That recipe wasn’t brought over to the States until the 17th century. Back then, cows and chickens were very accessible to most patrons. Americans also added liquor, but not just for the physical effects of alcohol. Liquor was used to help preserve the beverage and keep bacteria from spreading so it did not have to stay refrigerated to keep from spoiling. In the 17th century, the more popular liquor and the one used in this beverage was rum. Mostly because it was an untaxed liquor from the Caribbean. It was quite popular; American colonists had their own name for the egg beverage; grogs! Even George Washington had his very own recipe. Although his recipe portions are almost the equivalent to a modern-day eggnog A.M.F. It did include sherry, rye, rum, and brandy! Just like ours! His notes about the beverage though, say, "Let set in cool place for several days. Taste frequently." Some experts claim that his recipe is what might have even been the catalyst that caused the Eggnog Riots in 1826. Sometimes referred to as the Grogs Mutiny, there was a school, West Point, that banned booze, amongst other things, from their campus and a bunch of slick cadets thought they were above this rule. They decided to sneak in whiskey for their Christmas celebrations, but they didn’t sneak in flasks, they snuck in 4 gallons of whiskey and kept them in the barracks until it was time to enjoy their eggnog. Looks like everyone was trying to survive the holidays. “Get your dirks and bayonets ... and pistols if you have them. Before this night is over, Hitchcock will be dead!" Hitchcock made his way to the lower floor when a cadet took a shot at him. Hitchcock called in reinforcements but the drunken cadets thought he called in an artillery team.. The cadets proceeded to act like angry animals, breaking windows, smashing tables, all in attempts to defend themselves from, what turned out to be- themselves. Anyway, as for Eggnog, the riots only affected the recipe temporarily. Though President Washington’s recipe for the drink did forget to mention how many eggs to use- it wasn’t reason enough to start more riots. Therefore, the recipe had to be studied and redefined with different touches from different cultures throughout time to now- making it the perfect pairing for your holiday parties. American’s consume more than 135 million pounds of eggnog each year. That’s a staggering number considering it’s a holiday drink! 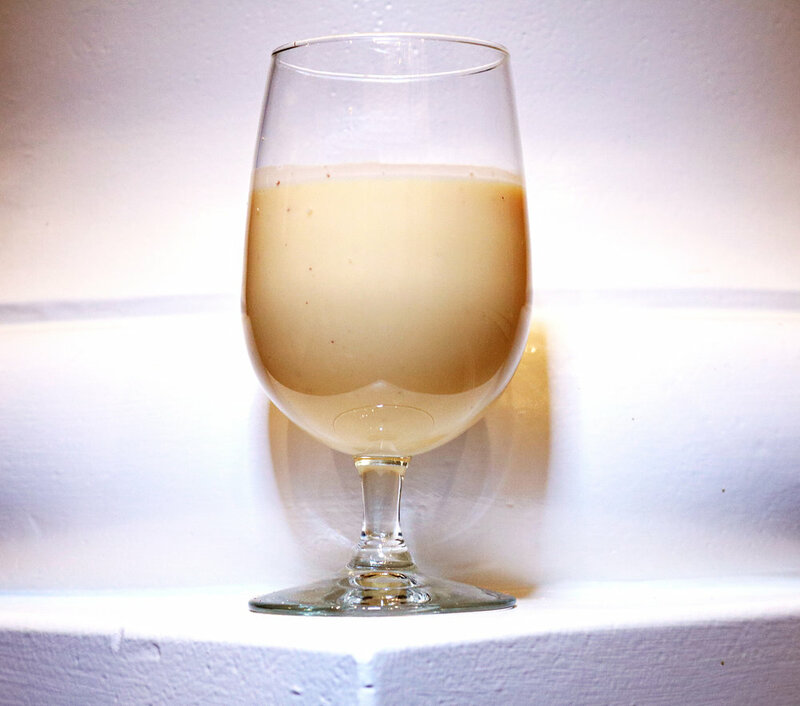 Whichever spirit you prefer to enjoy more, you literally have an eggnog recipe for it. However you choose to enjoy this holiday beverage, the options are endless! Remember, to drink responsibly this holiday season! We would hate for you to overindulge trying to stay clear of holiday tension only to create some more of your own.